U.P. Yoddha and Dabang Delhi K.C. won the Pro Kabaddi League eliminator 1 and 2 respectively in the first round of the playoff matches of the 2018 edition of the showpiece event. It was a stunning performance from U.P. 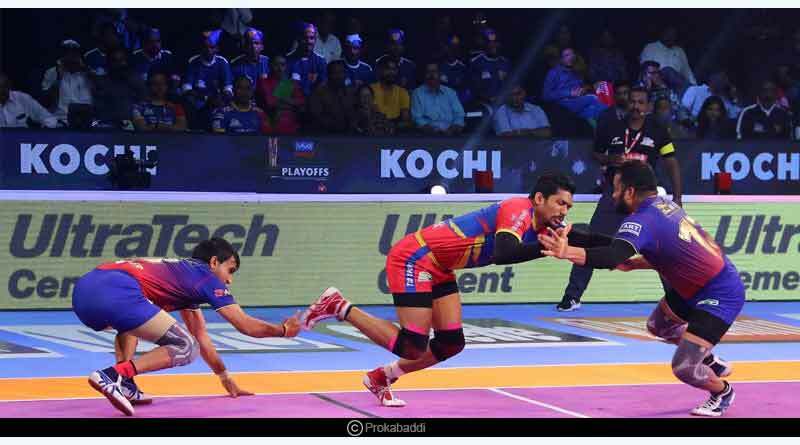 Yoddha who stunned favourites for the title U Mumba, 34-29 in the first eliminator of the day. Following up were Dabang Delhi who put in a spirited performance, coming back from a first-half deficit to show their strength in numbers with an eventually comfortable 39-28 win. Delhi started off the match well, taking the first point of the game before they lost focus midway into the first half to fall behind. However, a successful do-or-die by Maninder brought them back into the match before they went onto trail once again to go behind 17-13 at the end of the first half of the game. However, Maninder and Naveen went going to let go of the match so early, with both in imperious form on the night. Delhi’s two main raiders took the onus on themselves with Marinder gaining a bonus point quick into the second half to race Delhi into an 18-14 lead. Making the most of their momentum, Delhi went onto inflict an all-out, gaining four vital points. It was all Delhi from that point onwards as they went onto decimate their opponents, making light work of the eliminator. Naveen Kumar inflicted the second all out of the match, winning another Super 10 for his side, racing Delhi into a 10 point lead and with it a 39-28 win. Elsewhere in the first playoff match, it was a much feistier affair with two of the best sides in the marquee league entertaining the spectators to a peach of an eliminator. The opening match of the knockout stages of the tournament saw each side share points in a topsy-turvy encounter as a thrilling start saw the opening exchanges of the match see the scores level at 5-5. U.P. Yoddha rallied to the first all out of the match, gaining a five-point lead which proved to be all important come the final whistle. 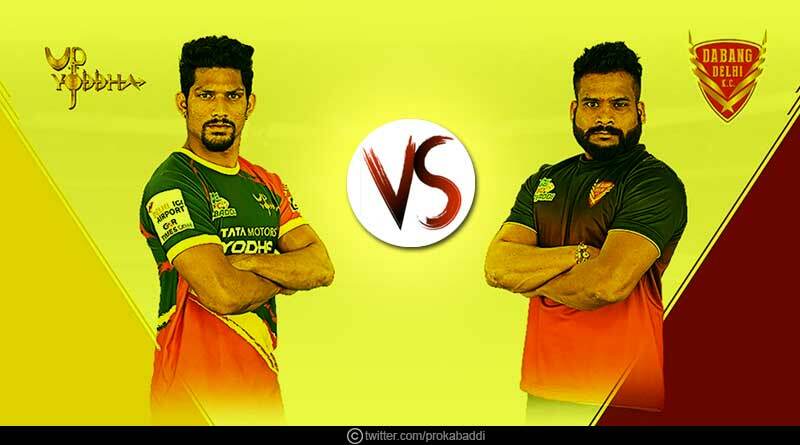 It was not U Mumba’s day on the attacking front as they failed to recover from the deficit, unable to break the Yoddha’s immaculate defence which had a stronghold over them throughout the match. Buoyed by excellent defensive performance, one lead by their tacklers, U.P. Yoddha’s tackler worked in unison with them to continue their dream and move onto a semi-final against Delhi.